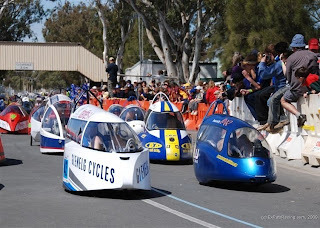 Bendigo Youth Racing has limped across the line in 3rd place at the biggest race of the year, Murry Bridge in South Australia. A combination of visibility issues and a fragile fairing helped to put BY-08 out of touch with the eventual top 2, Tru-Blu and Tafe SA's Blueshift. Once again BYR rider Michael Micallef details the weekend that was, which was spent once again with Flora Hill Secondary. Team Bendigo's weekend actually began on Thursday morning when we set off for Murry Bridge. The bus trip was extremely slow to say the least, but was made funnier when Rowan, who was transporting BY-08 in his Chev ute, arrived in Bordertown in bare feet. The story went something like this; With some aching feet making him uncomftable, Rowan took his workboots off where they sat in the footwell for some time, After a brief stop for refreshments Rowan noticed his door wasn't closed properly. He opened and closed the door whilst driving at full noise. Crisis over? Nope. In performing such actions he had accidently let one boot fall out, never to be seen again! Another great Rowan story. Eventually we got to Murry Bridge and unpacked. After a small prep to BY-08, we set off to have it scruitineered. No issues so we spent the rest of the afternoon setting up tents and the food prep area. With that done Team Bendigo headed down to the pub, where many a great time was had by all. Dave Maud arrived at this time, after having got his P's earlier in the day. Turns out too that he had Rowan's missing boot on him, after having stumbled on it down a long stretch of highway. Rowan pulled the dress shoes he'd been wearing for half the day off and reacquainted himself with his boot. Eventually we went to bed, exhausted from a tiring day on the bus. 1st day complete. Friday was a day for relaxing. We all got up when we wanted, had our showers and ate breakfast. After a couple of hours relaxing in the shade of Rowan's Pick up, we decided to head over to Design and Construction. It was an unscripted affair- when something like building a HPV really is a team effort, (which is less then can be said for a majority of our competitiors who purchase other people's designs and only have to worry about bolting it together and getting themselves fit in time) the conversation and input flows equally between all team members towards the judges. This has always been a BYR strength and the reason we do win many D&C's. BYR has only 1 rule, and that is if you don't build it you dont ride it. Which is something we are very proud of and will always continue. We left the D&C tent confident we had presented BY-08 to the best of our abilities. Later on in the day and it was time for the practice session. The session went really well, with all riders exiting the vehicle with positive thoughts. The vehicle felt strongest going down the back straight, with all commenting on just how easy it was to ascent the "hill". We all did an out lap, a full lap, then an inlap. Deven hopped in last and was half way through the routine when the chainline seized up. Turns out the return roller under the seat didn't tension the chain quite enough, resulting in the rough surface of the back straight throwing the chain off and jamming in the power roller. It was easily fixed after the session, and is something we're thankful happened in practice! After those dramas Cal jumped in one last time in an effort to test our "fog preventing devices". In the process he also set a lap fast enough to reach the top 12 shootout, recording a 2'34. I spent the final 15 minutes sitting on Channel 7 corner and observed many things. 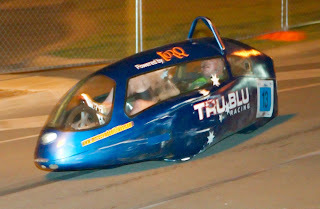 The Tru Blu was noticably faster through the difficult corner then any other vehicle. In my eyes it disproved the myth that a large track was needed for fast cornering speeds. Also of note was how unstable BY-08 looked going through that very corner- center of gravity is something we will concerntrate on more in the future judging by the conversation on the way home. With the session over we discussed any issues we had with BY-08, the peloton zooming past the pit lane as we chatted. Someone decided to ride into a pole down the end of the pit lane instead of ride with the group..... which of course is a very common thing to wanna do. After that little drama was sorted we all set off for bed, leaving Moo, Crowey and Tippet to prepare the vehicle for tomorrow. A great day had come to an end, with a greater day due to begin at 12 noon tomorrow. Up at 8am. 1 shower, 10 weetbix and 2 pieces of toast later and I was down at the front straight looking at a line-up of the fastest HPV's of each category for 2008. The shootout had arrived. Paul- "Here comes the Blueshift- BYR is looking VERY worried!" Chooka and Myself- "No we're not." Paul- "It looks like the Blueshift has the speed!" Chooka and Myself- "Yeah they can have the front row"
Paul- *leans in towards us, cupping microphone* "Just a bit of drama for the crowd boys- play along." Paul Richards is one of the great personalities of the AIPP. When the dust had cleared the shootout had produced some impressive times. Well actually, just one. Tru Blu's lap was a blinder. A 2'16 by Steele easily eclipsed the 2'28's set in the previous two years by Daryl in BY-06 and Dean in the Blueshift. The Tru Blu had cemented itself as the favourite. With that I went back to bed for 60 minutes, woke up and ate some lunch, then walked back over to the start line where all vehicles were gridding up. Cal was warming up at this stage. After clearing the grid I sat down at BYR Hill and watched the field roll by on their parade lap. The next lap around and the field was fair moving. Blueshift, BY-08 and Tru-Blu Racing led the field and so fast were the trio that they lapped the entire feild in an hour! We had our 1st problem at the 45 minute mark. Cal pitted in after leading the field and had the front right changed after a flat tyre got the better of him. After a quick inspection of the tube it was found that the tube was faulty. A detailed inspection of all the other spares showed that most of them were in the same boat. It was suspected the other two remaining tubes running around the track were also faulty. The defective tubes paid a visit to the bin, whilst Moo paid a visit to the Trisled tent to buy some replacements. Cal did 75 minutes before he pitted. Mark hopped in next, and was pumped to get lost time back. He did extremly well, lapping in the low 2'40's for 45 minutes straight, and settling in the low 2'50's in the last 15. However after all this effort nothng came of it- the leading Blueshift's rider was lapping consistantly 5 seconds faster. In any other race Mark's stint would've wiped the floor of any team, but not at a record breaker like AIPP 08 it would seem. Dave (shown right post stint) was in next and was even faster then Mark. After a faultless hour stint Dave had taken care of the Tru- Blu and was breathing down the neck of the Blueshift. Rowan in now and you could tell. Screw details for this stint- you only need one: By the time Rowan was jumping out BY-08 was up 2 laps on Blueshift by the length of the Cat 4 straight! My turn next. I watched Blueshift zoom past as I was entering the vehicle. The wiper went in with me, the door went down, and I was away. 1st lap around and Moo gave me the deficit to the already lapped BlueShift- 48 seconds. Thirty minutes later and I was excitedly overtaking the Blueshift down the front straight, after a run of mid 2'40 laps. Four laps later and something was wrong. Steering in the right direction through traffic washed more speed off then expected. The vehicle was also a dog through BYR Hill, unable to hold it's line without really wrestling it around. The final straw was when Blueshift shot past me down the front straight. I just couldn't follow it through the 1st half of the track. It was official. I had a slow leak on the left wheel. I rode until my lap times blew out to low 2'50's then pitted for a replacement. Moo ripped the left off and put the replacement on. It wouldn't go the last little bit however. After a quick inspection by Crowey it was found the bearing was still on the kingpin. It was taken off and the replacement went on successfully. Meanwhile the floor pump was out on the rear wheel. The rear was sitting on 20psi unbeknown to me. It seems all of our starting set of tubes were duds, and we were paying now. With the rear temporaily fixed I set out again. It looked like I'd be in for more chasing. 2 laps in however and I discovered Blueshift just leaving their own pits with a fresh rider. I finished my 90 minute stint with the Blueshift 2 laps down. End of 1st stint. Chooka and Gavin filled in the next 2 hours and did a faultless job of it. The rear wheel was changed when Chooka hopped in, which allowed Blueshift to get 1 lap back on BY-08. By the time Gavin was done we were approaching 2 laps on the Blueshift once again. Deven made his 1st appearence in the race and had a tough time of it. Our trademarked and patented fogging which has hindered us for so many years predictably reared it's ugly, destructive head once again. This time though it wasn't the cause of our 1st collision in the race. Deven was happily riding down the back straight, minding his own business, when he collided with an exposed rear wheel of a vehicle with no rear tail light! The impact was even more surpriseing. Where as such an impact in a Kevlar fairing would result in simply bouncing off said wheel, it instead tore a massive hole in front of our wheel well. Deven pitted straight away, where BY-08 was "stitched up" with zip ties and "bandaged" with racetape. Deven stayed out a little while longer before pitting. 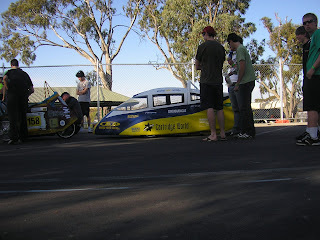 We lost alot of time on Tru- Blu and Blueshift, sitting 1 lap behind the aforementioned. I went to sleep after Dev's stint and woke up about 1230 Sunday. I strolled into the pits with my stuff and spotted a hastily scribbled piece of paper on the tool chest. It read, "Never EVER give up. Never stop trying". It was obvious to me that something was amiss and my suspisions were confirmed when BY-08 went past. The left side was a mess. My frown got longer when Moo told me that was the better side! Cal had come a cropper trying to navigate through heavy traffic and running into a barrier through the esses. We were sitting 1 lap down on Blueshift, with Tru-Blu's light issues earlier in the night, paired with a foggy windscreen putting them in 3rd. Having said that we were losing much ground on said vehicles and it was only a matter of time before they overtook us. Mark was in currently and was obviously feeling the effect of having no visibility, with 3'10's being the norm over the course of his 90 minute stint. Our wiper worked fantasticly, but required constant use, which in itself slowed progress. Funny how things meant to uncomplicate matters accidently complicates matters! Towards the end of his stint Mark started drifting into 3'15 territory, so with Blueshift approaching their 2nd lap up on BY-08, now was never a better time to pit him in. It was drilled into my head how important conservng the vehicle was. Use the wiper constantly, keep away from clusters of tail lights and no risky overtaking that could result in contact. Any contact- The hybrid weave we had trialled for the 1st time on BY-08 was just way too fragile. Most of these hits on our vehicle at this stage may have resulted in only minor scuff marks on any other fairing, but vaccum bagged hybrid weave officially wasn't up to the task. Live and Learn. Mark eventually came in and I jumped in jumped in along with a fresh windscreen. I sat on 3'05's for a long time, before settling on 3'10's. The windscreen wiper worked fine but couldn't wipe clean the far sides of the windscreen that mattered for seeing apexs and competitors. After an hour I lapped the Tru- Blu. They seemed to be in more trouble then us it would seem, as I lapped then pretty easily. With 15minutes to go a fog-less Blueshift blew past me at what I'd estimate was 10 seconds a faster lap then what I was cruising on. Ex Pats, Ballistic and Tru- Blu followed in a loose attempt at a train, Tru-Blu going much faster then before. With 5 minutes to go I too (like Mark) was approaching 3'15 lap times. 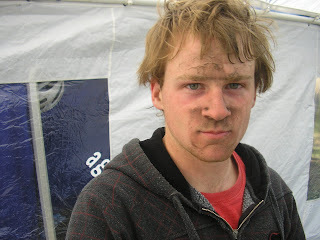 I pitted in after 90 minutes, with the vehicle still in the same condition I left it in. I was as happy as I could be at this stage of the race. Chooka was in next and didn't dissappoint. He provided a much needed reprieve for BYR, being the only one to lap faster then Blueshift during the night. After 45 minutes however he too jumped over the 3 minute line. Meanwhile Tru- Blu had discovered the cure for their fogging woes and were now blowing away everything on the track. With lap times between 2'45 and 2'50, not even the Blueshift could keep up. We suffered the most, with Chooka losing up to 25 seconds a lap until the end of his stint. Talk went back to cutting Ned Kellys in our windscreen. The next rider, Gavin, and the pit crew responded with a resounding NO! At that point I went to bed. Three hours later and I was awoken again for my next stint. Due to a stragety to conserve 4 riders for the last 6 hours, Chooka, Dev Gav and Myself had a pretty hectic schedule during the night. BY-08 was still circulating at a great pace, but looked worse then it did hours before. Gav had a big crash involving a vehicle without a tail light and Dev just ran out of talent at some stage in his 90 minute stint. 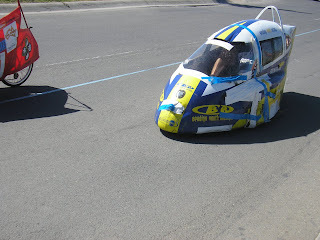 The vehicle was in tatters, with the sides of our fairing only being supported by pieces of corflute. Ironic given we moved away from such an inferior material 5 years ago and now it was the last line of defence for our enclosed wheels. Even so Rowan was out there doing his thing, scheduled to do a 2 hour stint to take BY-08 into the daylight of Sunday morning. What we didn't schedule was Rowan crashing. Moo's brother, riding Flora Hill's BRUM, rode past with his head out screaming out "BY-08's in half!!". He actually wasn't far off. Rowan pitted for some minor repairs..... one broken crossmember (only part holding the front left wheel and it's steering components to the rest of the frame was a 25mm dia. tube), two broken fairing mounts, 1 broken tie-rod, 1 pulverised front left wheel and a shedload of zipp ties. It was a weird incident, because Rowan couldn't actually say what he hit. He was way right of a group of taillights, cruising in open space, when he was stopped dead on the back straight. The sudden impact rolled BY-08 over. Short of a block of concrete crossing the road..... or a Triceratops in Row's statement, we had no idea if Rowan hit a vehicle...... or what he hit! All we knew was that it was hefty enough to destroy BY-08's chassis. Repairs took a good 13 minutes, so Rowan jumped back in and had another go. Another hour later and he was back in after having a run-in with 4th placed Ballistic. Going through the spoon drain, the Ballistic got a little too close, pushing the inside line....and BY-08 it would seem. Rowan spun onto his lid and could've nearly had a conversation with the Ballistic rider, who was on his lid next to him hahahahaha! It wasn't as bad as it could've been, so minimal time was spent in the pits. Eventually Rowan pitted in for good, after a whooping 210 minute drama filled stint. It was now light and I was hopping in for my last stint of the race. Pretty uneventful except for a battle with Ballistic for 5 laps. Oh and of course the broken crossmember didn't help the approach into Channel 7, the whole left side "flex-steering" itself under brakes. Very light on the brakes or I was on my lid! The nose was also on the ground after Rowans stint, meaning every bump in the road was literally felt through my legs. I pitted in after a measly 40 minute stint. I was meant to go 60 minutes but due to a lack of communication with the pit I was unaware exactly how long I'd been in. Oh well. Dave jumped in but not before I told him the state of the vehicle. This was all communicated whilst the pit crew created a new fairing mount for the nose ( a pole zipp-tied to the boom and extending out past the nosecone, covered in tape) and replaced the windsceen. Dave had 11 hours of sleep under his belt and it showed in his lap times, with nothing above 2'50 for an entire hour. In the final moments of his 1 hour sprint he come undone, rolling the vehicle on the Start-Finish line after slamming the brakes on to avoid a pileup ahead. The heavy application of brakes speared him in front of another vehicle, with said vehicle T-boning BY-08 in the side. I think it was rider error on our part. Sorry for any trouble caused. Mark jumped in for his last stint, belting out 2'55's for an hour then 3 dead for another 15. A really great run from the 6ft 3", 90kg monster. No incidents. Chooka jumped in for his final stint, going for 45 minutes at mid 2'50's. No incidents. Finally it came down to the last hour and thus Cal's final stint. He bested a 2'42 in the hour and hovered around mid 2'40's for all of it. What a machine. BY-08 crossed the line n 3rd place. Amazing after such a dramatic night that saw us run out of race tape and spend very close to 1 hour in pits, not to mention losing the lead and unfortunately destroying 9 months of hard work that was BY-08. 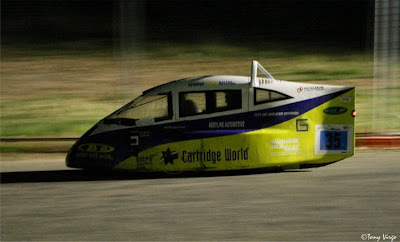 Aside fro the race result we also claimed 1st in Design and Construction, 2nd in presentation and Cal Ridge secured the fastest lap of the race award, adding to his Maryborough lap record. We've come away with many lessons. Firstly kiddies, listern to Ex Pats and ouselves when we say Hybrid weave is B-A-D. Especially if you're thinking of vac- bagging. It's not worth the extra outlay for such a fragile product. Also it'd be great if every team put their lights on before the race started- LED's last for weeks when left on and may have prevented some of our incidents. Live and learn. 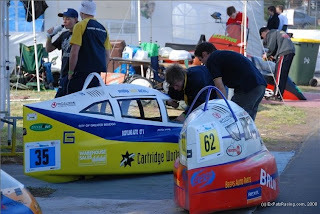 A big thank you to Flora Hill Secondary College for sharing facilities over the course of the weekend and Cartridge World Australia for their amazing contribution to our team over the course of the year. Another big thank you to all our friends and family for providing support for us all year and cheering us on at the race. We love you all. Congratulations to the good guys of HPV racing, Tru Blu, for finally finding a combo that worked well enough to win them a race. You'd wanna win after spending such money and you didn't fail. Another congrats for Blueshift for coming so close to the double. They showed great consistancy and clean riding- something all of us can look up to. 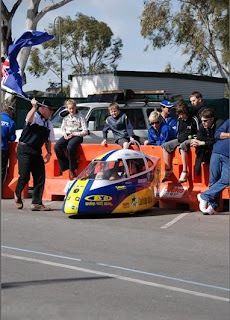 You can catch members of BYR in November at the RACV Energy Breakthrough. Another interesting race review. Well done considring all the badluck (self inflicted and otherwise). My Name is Jason Lentakis and I manage / run the Gleeson Gollege teams. I wanted to pass my congratulations on to the Flora Hills team for there fantastic effort. We were so busy at the end of the race that I forgot to catch up with them. Plaeas pass this on to them and congratulate them for a super effort. We really enjoyed the race and I loved the fact that our kids got pushed along so much. This enabled us to go way further than ever before. We were one of only a few corflute bikes to get some decent distance but are thinking long and hard about taking the next step. It is great that you guys from Bendigo keep coming over and lifting the quality of competition. We look forward to some more close battles next year. Thanx for your valuable comments, Jason. The message has already been passed on. 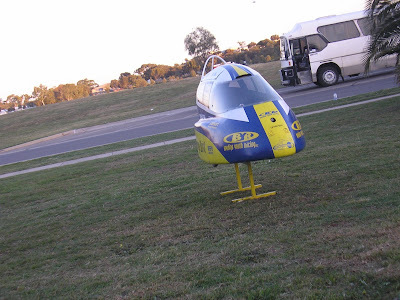 Hyper was an extremely fast vehicle. So fast in fact that Flora Hill's Buff Duck would've been beaten by Hyper by 10 laps in the 2007 race. Composites are a tough slog, so don't lose heart in your ideas too soon. Blueshift prove you can go fast on a corflute budget. Good luck in round 1 and we'll see you next year. Current Sponsors: Warehouse Sales, Decked Out Coaching, L.W Nankervis Performance Boats, McCullochs Engineering, Heavenly Threads and PTR Engineering. Past Sponsors: Bendigo Bank, Bodyline Automotive Paints, Moronis Bike Shop, City Of Greater Bendigo, Bunnings Warehouse, Cathcart Smash Repairs.